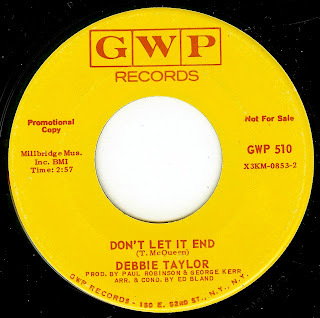 Cutting a mysterious figure (no known sightings until it was recently discovered she went back to her real name after the last release as Debbie Taylor in 1975), Debbie Taylor was allegedly discovered singing in church by a Decca records scout. Under her real name (Madie Myles) this incredible singer is out performing music again. Read more on her very nice website. Debbie Taylor's voice is OUTRAGEOUSLY powerful; on this cut, it's almost as if she's on the verge of just completely blowing it out, yet somehow stays right on track.